Music is something which is needed by most people who are in the publishing industry. I remember making youtube videos where I then later need royalties free music. There are websites which provide free music to download. The authors of these royalties free music make music for general public good. You can download these mp3 files legally and use them in your own work. 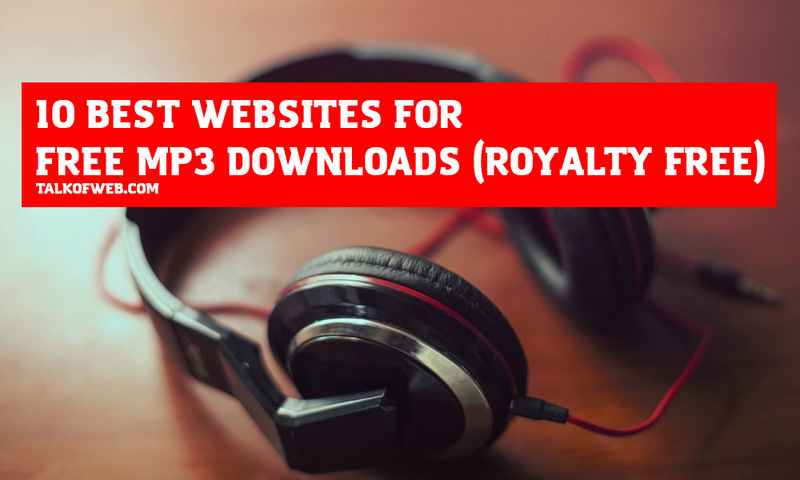 The process of legal mp3 download was never so easy without these platforms which we are going to share with you in this article. Make sure you bookmark this page if you are really interested in getting mp3 versions of free music. The following websites are amazing and will help you achieve your purpose. You can use the mp3 downloaded from these websites in your YouTube video, you can use it as a background of your new PodCast. You can also use this music in any of your Adobe Premiere Pro Works. Not to be afraid of the list, some websites provide royalty free music in this list while others provide totally open source music. This is an amazing website for finding some great piece of music and download it for free in mp3 format. There are a lot of creative commons sound available in mp3 format on this website. There are some authors who have uploaded their work but they have written in the description to not use for commercial purposes. You ought to read the descriptions of specific free music files before going for download. You need to signup before you are allowed to download the files on Free Sound. Creating an account to get access to creative commons licensed music is also free, and it has no membership fee. What you need to do? Just create an account on Free Sound, start searching for your keyword related music. The artists have labelled their music on the website, a peaceful melody has tags peace and melody. Search for your required tags and you’ll get related music absolutely free. Incompetech really does wonders, an amazing collection with the perfect balance of music and keywords. The keywords you search for are highly related to what sort of free mp3 music you’ll find. You find your related music which is free to be embedded inside your youtube work. The website asks for a small favour, all you need to do is to put the given credits inside your work, in the same format which website provided for its individual free mp3 music. They are not using their own search box, instead, they use the Google’s Custom Search Box. You need to visit the link below and put your related music tags in the search box powered by the Google. On hitting search open any music with the sequential order and listen to it, if you love it then download and give credits. This website works in the way the name sounds! You have kids and you want to have some legal music, you are working on some children project and you want to add some free music? Well, this website is for you! There are poems, there is music suitable for children and every colourful thing is present on this website in the name of music. However, certain poems/music collections are to be downloaded and limited to personal use only. The disclaimer is written on the page where you try to listen and download your required mp3 file of music. Everybody knows last.fm and it has created its awesome credibility in those last years. You can search and find millions of tracks on last.fm. It also features some recommendations. There are certain songs which are under creative commons license. You can also download mp3 format of those soundtracks from Last.fm, the thing is if you want to find something good and make sure that you can use it inside your precious work, then last.fm can be your one of the music jungle resort. If your work is non-profit or non-commercial, then these both providers can work like a charm. They are both well known and people know them for their soundtracks. If you want to download their free soundtrack then we’ve got the source. Visit Dano Songs – You can find a variety of royalty free mp3 tracks there, don’t worry these are well crafted and you might find something worth using or listening. You can also contact him and ask if he can provide you songs and in return, you may credit him inside your work. Read website details as well, so that you are aware of any license and usage details. Visit MobyGratis Soundtracks – Moby Gratis initiative is quite unique and his most users are those who are music students/3d modelling students who want to use his free music in their projects. All you need is to visit his website, create an account and then file an application. After the application, you are able to download the royalty free music, which you can use in your own videos and projects. They say don’t forget to share your work with them once you are published. Amazing also has the mp3 free download collections. You can download tracks for free from various artists. Alice Cooper, Calexico, Ingrid Michaelson and Paul McCartney are providing their music for free over Amazon. The only limitation with this Amazon choice of mp3 downloads is the restriction of being a US resident. If you are online from USA then you can download these mp3 soundtracks legally. Free soundtrack music lets you browse their different music assets. Some of these soundtracks are free while others can be used if you give one or required credits to the soundtrack. Once you visit the website you’ll understand the terms of the usage.Some tracks are royalty free which can only be used for the non-commercial usage. The procedure is same, you can search music tracks with certain keywords. Then you can download those tracks. You may need to create the free account in order to download some tracks. Free music archive is a site which provides you soundtracks and free music to be used in podcasts, youtube and your other publications. The good part, which is present inside free music archive, is the ability of curated best music lists from famous musicians. We being common people can only listen and give votes, but what if good music is already present on one click and every one of the tracks played is actually your favourite. Free Music Archive can be termed as a music library giving the internet a proper space to download music for free legally. 9- PacDV – Looking for sound effects for free? If you are looking for sound effects for free, PacDV gives you an opportunity to do that with your projects. It provides you free sound effects and even background music in the downloadable mp3 format. The most music is licensed under the creative commons but still sometimes you need to give credits because of a slightly different license agreements. Make sure whenever you find a music piece, the license is read properly. PacDV also provides links to third party sites for the free soundtrack downloads. Visit PacDV and download free music tracks! 10 – ccMixter – Free music from 45000 musicians all around the globe! The ccMixter boasts of its 45000 musicians community present on the website. You can search for various music tracks which are under the creative commons license. You can use those tracks in your own work, while sometimes giving credits. The library is really good and you may have to create an account before being able to download any mp3 track. The musicians on this website create tracks, they signup and then they upload their tracks.